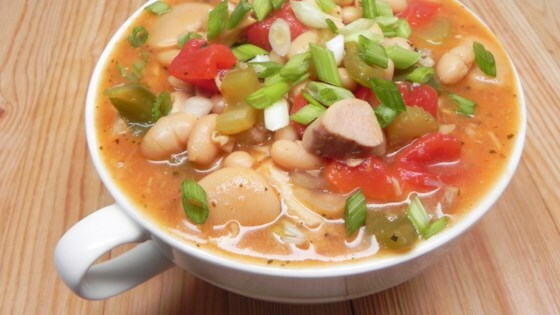 "This is a healthy chili made with 2 kinds of white beans and low-fat ground turkey breast. Fast, easy, and reheats well." Heat olive oil in a large pot over medium heat. Add turkey, onion, green bell pepper, and garlic; cook and stir until turkey is browned and onion is translucent, about 5 minutes. Stir tomatoes, celery, cumin, chili powder, bay leaf, and basil into the pot. Pour in water; cover and simmer until celery is tender and chili has reached desired thickness, 10 to 15 minutes. Stir in navy beans and lima beans; cook until heated through, 5 to 10 minutes. Season with salt and pepper. The cumin in this recipe is what makes it smoky and rich and delicious. I don't recommend omitting it. If serving over rice, make chili thicker.